Bike on a Metro North train in Connecticut. One day you’re a seasoned Connecticut cyclist with intelligence and connections and the next day someone’s staring at you blankly because you asked what a Clipper Card is. So I’m trying to get used to the idea that I’m moving from Connecticut to California. Part of it involves having to relearn a lot of everyday things that are incredibly stressful to me but seem profoundly silly when I explain them to someone else. Using the Caltrain for the first time was one such area of stress. I’ve used the Metro North in Connecticut so many times I took for granted the conductor with the mesh-topped hat coming around with the little custom hole-punch to pop a tiny hole in my ticket and charging me the Blue Book value of my car for not having a “Peak” ticket during Peak times. Not so in California - and that was only the first difference I’ve found when traveling by train in the state once helmed by the star of Kindergarten Cop. 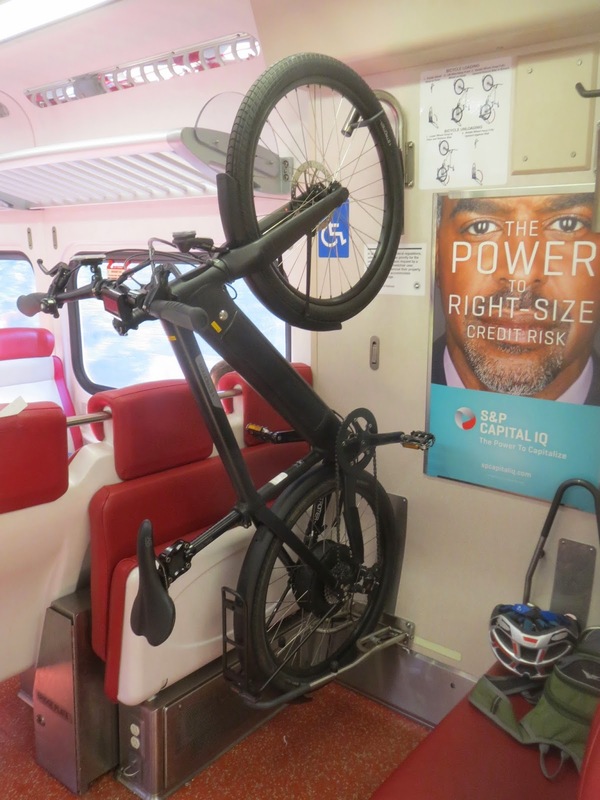 Now as you know bikes on trains is a big issue in Connecticut. Metro North allows them on the train absolutely anytime except when it would be useful for a bicycle commuter. Racks, promised to cyclists years ago, have now appeared sporadically in Metro North but they share the same space with foldable seats. The racks themselves only hold two bikes per car. Things are different out in Silicon Valley. And by different I mean, better. Visiting the Redwood City station one morning I saw several bike commuters waiting with people who didn’t have a bike. When Caltrain pulled up you could tell right away it was bike commuter friendly. Further research - done with me apprehensively carrying my Bike Friday on a train I later discovered was carrying me in the wrong direction - confirmed that the “Bike Car” had spaces for 40 bikes. Having them lean on each other with bungees is far from perfect but this was taking an awful lot of cars off the road which is the point of building this kind of infrastructure and policy. Finally, many Silicon Valley bicycle commuters place a yellow tag on the bike with the destination station written on it. The reason is so you can try to lean your bike with other bikes going to the same destination to make it easier to get on and off the different stops without having to dig your bike out from under a pile. I don’t understand: Connecticut attained statehood in 1788. California in 1850. How did my birth state squander its 62 year head start? I may never know the answer, but any conversation about fixing Connecticut transportation infrastructure has to include these kinds of improvements. Making trains easier for cyclists means making the train a good alternative to #choosethebike instead of adding another car - electric, hybrid or otherwise - to the road. But now that I know how beautifully friendly the Caltrain is to bicycle commuters (and I finally know what a Clipper Card is) I’m going to use it as much as I can to get around. If you're in California, haven’t used this system, and are tired of queueing up at red lights: I recommend you give this a try today, seeing as it is Earth Day and all - and/or during Bike to Work Day, which is May 14th in Silicon Valley. If you're in Connecticut, demand better bike access on trains AND make a note that Bike to Work Day is on May 15 (not sure why the CT BTWD is different from CA. May have something to do with the three hour time difference). Thanks for reading and thanks for riding.